ADS Adware Remover is made by Ashley’s Digital Solutions. It can be purchased on adware-remover.net, the official site of the product. Free evaluation version exists and can also be found there. However, we DO NOT recommend you to download and use ADS Adware Remover because of several negative facts about it. This application uses false positives. We have tested evaluation version on clean system. ADS Adware Remover reported that several registry entries are related to browser hijackers and should be repaired (see screenshot below). However, all these entries were used by fully legitimate software, such as Windows Media Player, and didn’t possess any threat. The program refused to remove any critical objects it found and asked to purchase full version. 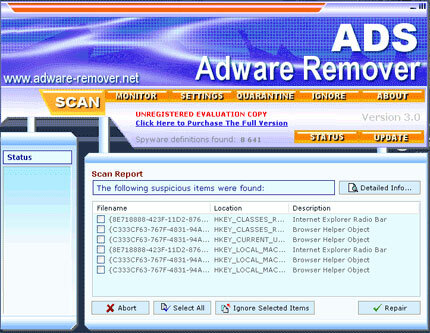 ADS Adware Remover functions, settings and other components exactly resemble those found in other antispyware products, such as AdDriller, Ad-Where 2005 or AdwareX Eliminator. All these programs are knockoffs of legitimate Ad-Aware antispyware. They use the same spyware definitions database file and produce similar scan results. 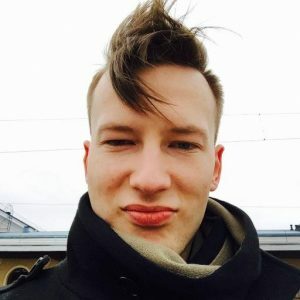 The official site is very simple. It lacks detailed product’s description, screenshots and other common information. This entry was posted on 2014-05-11 at 17:46 and is filed under Corrupt Anti-Spyware, Software.